On my second trip to Northeast Ohio, I am learning lots of new things as I attend a Center for Scholastic Journalism Board Meeting this week at Kent State University. KENT, Ohio– My second visit to Northeast Ohio started this morning with visions of snow on the ground as our plane flew into Cleveland-Hopkins Airport. Hey, the renovations that were going on at the airport when I visited in September 2009 are done and the airport looks great, though not as busy as I expected. After spending much of the day touring the Cleveland area, including the area known as Ohio City and the Beachwood Community with a former faculty colleague, I am enjoying the small college town of Kent, an hour’s drive from Cleveland. 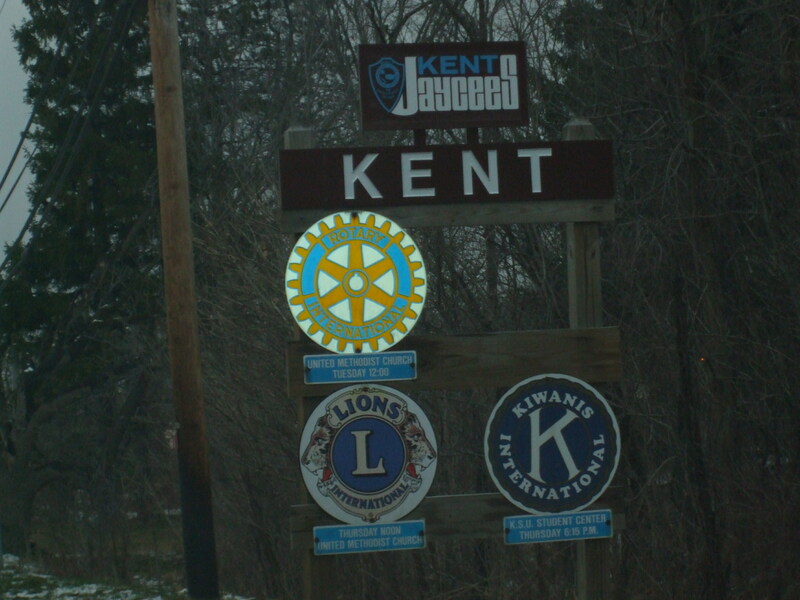 This marker on U.S. Highway 43 tells you're just about at Kent State University. We’re in town for a meeting of the Center for Scholastic Journalism Board, which had a kick-off dinner tonight at the Pufferbelly, Ltd., an old railway depot in the heart of Kent. The Center for Scholastic Journalism is one of the leading College efforts to focus on outreach and research involving middle and high school journalism. It’s great to gather with colleagues from around the country who are advocates for getting students turned on to journalism at an early age. Many of these same individuals are teaching in journalism programs at colleges and universities from as far away as California. Other members represent key journalism organizations such as the Radio-TV Digital News Foundation or the Newspaper Association of America Foundation. 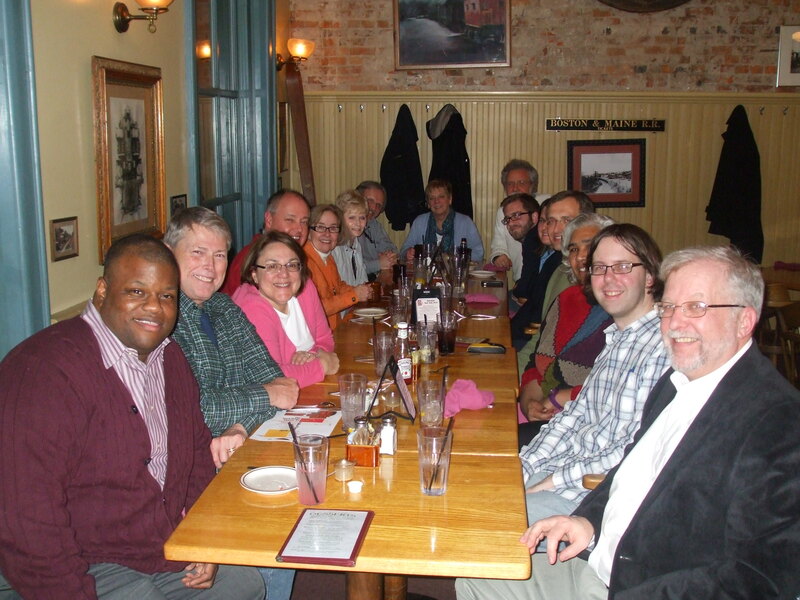 The Center for Scholastic Journalism Board posed for a dinner shot after our great meal at Pufferbelly, Ltd. in downtown Kent, Ohio. 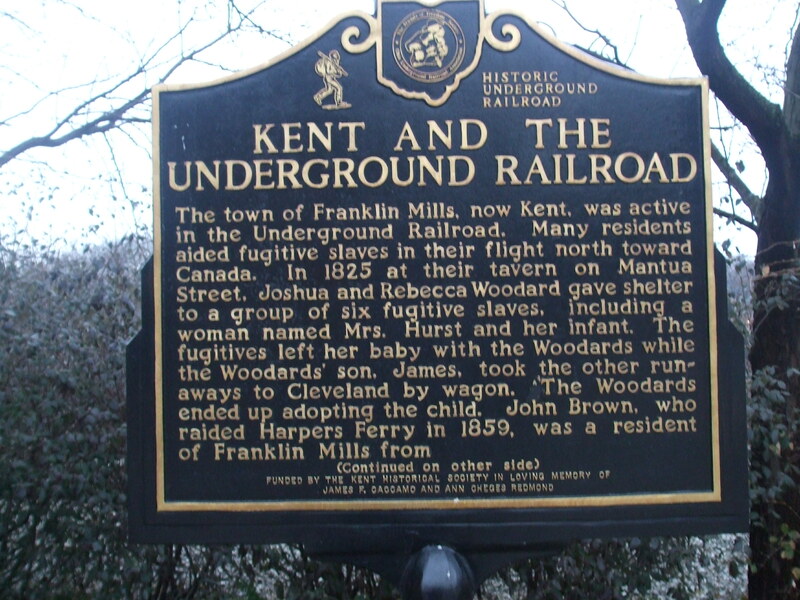 I learned tonight that there is a bit of history of Kent as a stop on the underground railroad. A sign outside of the Pufferbelly helped me understand this interesting fact about Kent. I’m told a new hotel is being built here in downtown Kent that will have a conference center attached to it. So, I bet this will not be my last time to visit Kent State University. Even as I write this post, I am watching an old co-worker from my days in Cincinnati, Dave Summers, who is now working at WKYC-TV Channel 3 in the Cleveland market. Dave hasn’t changed a bit since we worked together at WLWT in the 1990s. Looking forward to seeing more tomorrow on the Kent State University campus in Franklin Hall, home of the School of Journalism and Mass Communication. Waking up on the Arkansas River here in downtown Little Rock. LITTLE ROCK– Even though I’m only here for 14 hours, I am sure glad I made it my business to get up early and do an early morning walk along the Arkansas River in order to see the sun rise. 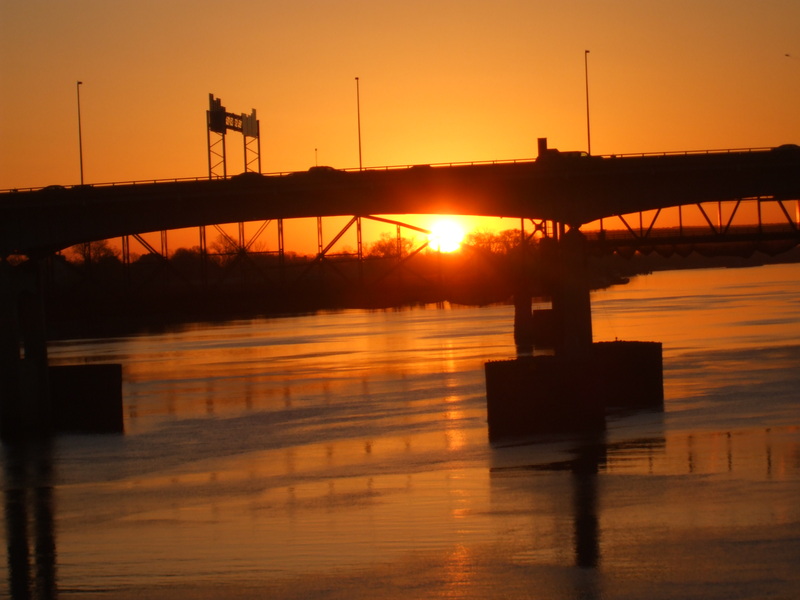 The sun rises on the Arkansas River as morning traffic crosses on the I-30 Bridge. This was my second time walking along this great waterway. Seems it takes an academic conference to get me to this city. The last time I was on an overnight stopover on the way to a convention in Kansas City. What’s different this time is I managed to get some great photos of the Little Rock downtown skyline and a couple of six bridges that cross the Arkansas River. One of those bridges, The Broadway Bridge is right in front of the window from my hotel, The Doubletree, which looks out on the River. The Robinson Center is adjacent to our hotel. It was nice to see the welcome sign when I arrived last night. 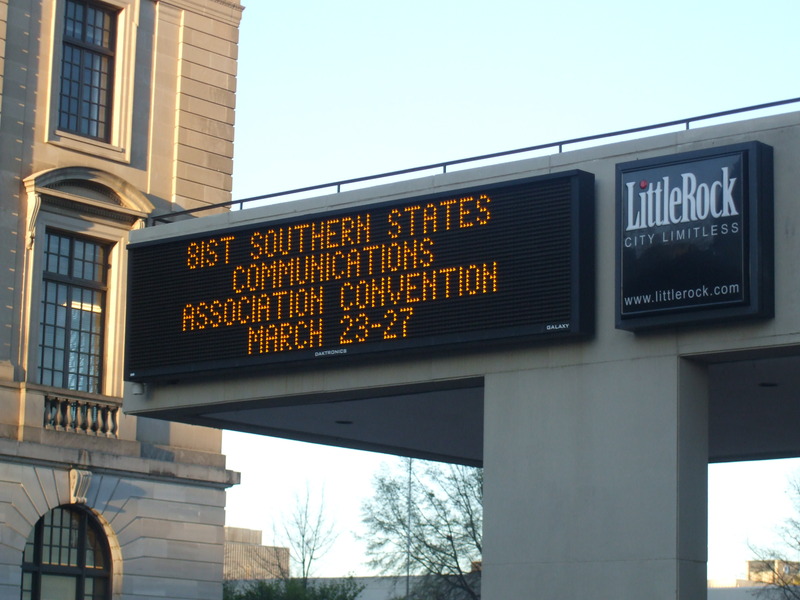 I’m in the Capital City of the Natural State today for the Southern States Communication Association Annual Convention. Besides participating in a panel discussion about the Journalists and PR practitioners working together in covering the Albert Pike Flood, I have another mission this morning: to check in on the Clinton Presidential Library. My parents and I visited here in 2003, before the Library opened. They’ve requested a souvenir. We’ll hope to oblige in a short 90-minute window this morning before a session at 11 a.m. In between that visit and my session, there’s a great session on social media coming up this morning. I am hoping to capture some highlights of that session in an update here on BAMAPRODUCER later today. First half of Church Media U has been spectacular. Looking forward to this afternoon. COLLEGE PARK, Ga.– We’ve reached the lunch break at the Church Media U seminar here in College Park, Ga. And, I am so excited after just three hours of presentations, I can hardly contain myself. There are so many recommendations and suggestions that we can put immediately to work. In the first presentation this morning– key recommendations for the WAY we do church announcements. What is the philosophy behind how we use technology to inform our members about upcoming activities and events. Wow! I have a page of notes just on that topic alone. 1) How do I get BEYOND PowerPoint in sharing points in a sermon? 2) Does Media Ministry have to mean Major Investment? Key lesson so far this morning– Media Ministry equipment are scalable. We’ve already talked prices for projection systems and there are some that are less than $1,000 and for various sizes. 3) What can one do to recruit volunteers who are willing to make this all work? Think about people’s talents– recruit the creatives (art, visual talents) and the highly-disciplined, strait-liced volunteers. There are places for them in the media ministry. 4) What about the naysayers who say this media thing is all glitter and no substance? Answer: Most children now are going to school in environments where MEDIA are a given. They don’t know anything else but media. But, the multi-media are NOT the MEAT, they are the ketchup on the side. The MEAT is the message, which is the Word of God. 6) What is the most effective way to organize ministry volunteers to do media? Answer: Have at least two people working the media ministry on a Sunday, one that is gifted in one area (i.e. visuals) and the other with more technical expertise. 7) How much money does it take to transform one’s worship experience? Answer: It’s scalable– Quotes for software were given for SINGLE USER licenses and SITE license for multiple computers. There are various displays available as well — LCD vs. DLP. 8) Is the mission of media ministry different in 2011 than it was 2001 or 1991? Answer: The mission isn’t different, but the methods (the WAY WE do it) is changing. We saw a three-way comparison (10 years ago vs. 5 years ago vs. NOW) today in how to present worship elements (songs, sermons, announcements) on the screen. 9) How do you use media without taking away from the presentation of the Gospel? ANSWER: You DON’T take away from the Presentation of the Gospel. Sometimes a BLANK screen is best. Don’t let the multi-media drive what you’re doing in worship. The example used today was how during Holy Communion, it’s sometimes best to have NO images on the screen. 10) How do social media play a role in what we do as the Body of Christ in 2011? 5) Should we be streaming our services and why? Plus discussions about video shooting.. In College Park, Ga. for the Church Media U daylong seminar and hoping to walk about with answers to some key questions that baffle me as a key point in technology ministry. COLLEGE PARK, Ga.– We are waking up next to the World’s Busiest Airport this morning with great anticipation about what will learned today about doing church media ministry. Church Media U kicks off its Atlanta area workshop within the hour here in College Park next to Hartsfield Airport and I’m looking forward to getting some ideas to take back to my church. This is the first in a new series of workshops that are aimed at presentation techniques, use of various technologies and social media. I’ll admit it has been a struggle to get here in the middle of the week after Spring Break (For those of us who are educators) and in between two other conferences. The workshop is only a six-hour workshop and I have carved out a pretty hefty agenda. But, these are certainly questions to ponder and build on even after today. I’ve not met Josh Lyon or Darren MacDonald, who will be facilitating today. So I’m sure it will be just a treat to make a connection with some experts on the topic. The 2011 AEJMC Southeast Colloquium featured a great panel of new research on social media and social networking. COLUMBIA, SC– We are continuing our three-day trip to the South Carolina State Capital where the AEJMC Southeast Colloquium and Media and Civil Rights History Symposium are meeting simultaneously. This afternoon, the Colloquium featured a panel of research presentations related to social media. As one who is just really entering this area of research, I found the paper presentations and discussion that followed to be very interesting. Daxton “Chip” Stewart from Texas Christian had graduate students in one his classes researching the social media policies of journalism and strategic communication companies. He found that while journalism organizations and strategic communication organizations have policies that include transparency, friending rules and the personal-professional divide, the journalism organizations seemed more restrictive. While she’s not shown in this video, Kayla Gutierez, a recent graduate of the University of Florida, gave a great talk about the attitudes of students vs. faculty when it comes to privacy in social networking. Her focus group research found the most common form of control when it comes to prviacy was untagging or deletion. Most users did not invest much time in managing their profile pages. 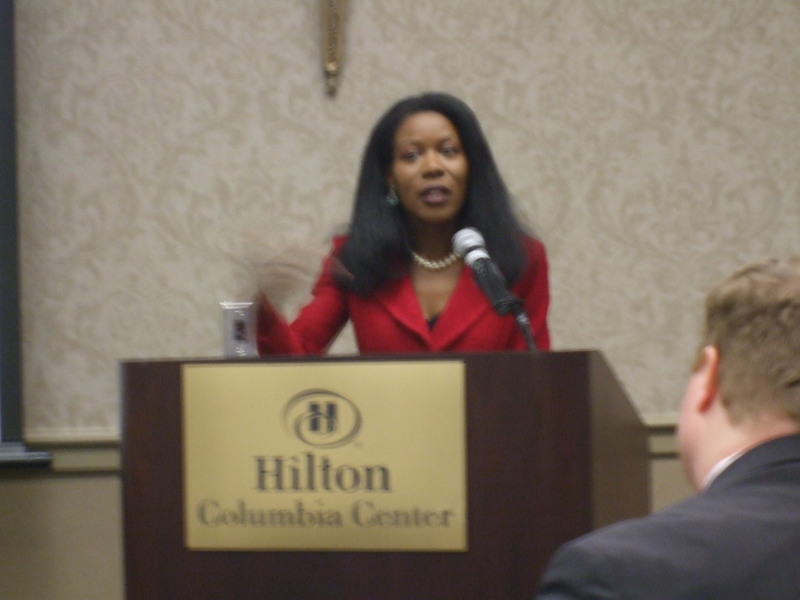 COLUMBIA, SC– The highlight of the two-day AEJMC Southeast Colloquium and Media and Civil Rights History Symposium came Friday during a lunch where Isabel Wilkerson told the story behind her recent book, The Warmth of Other Suns. The D.C. native was very forthcoming as she told her story as a daughter of domestic immigrants from Georgia and Virginia. Her parents’ experience moving from Virginia and Georgia to the “North” was exactly what she characterizes in the 600-page book based on 15 years of research. Wilkerson’s mother was from Rome, Ga while her father grew up in Southside Virginia. A former New York Times bureau chief, Wilkerson is a former editor-in-chief of Howard University’s campus newspaper, THE HILLTOP. As a HILLTOP editor myself, I was especially gratified to be on hand for her luncheon address as was my journalism professor colleague Dr. Kim Smith, who teaches at North Carolina A&T University in Greensboro. 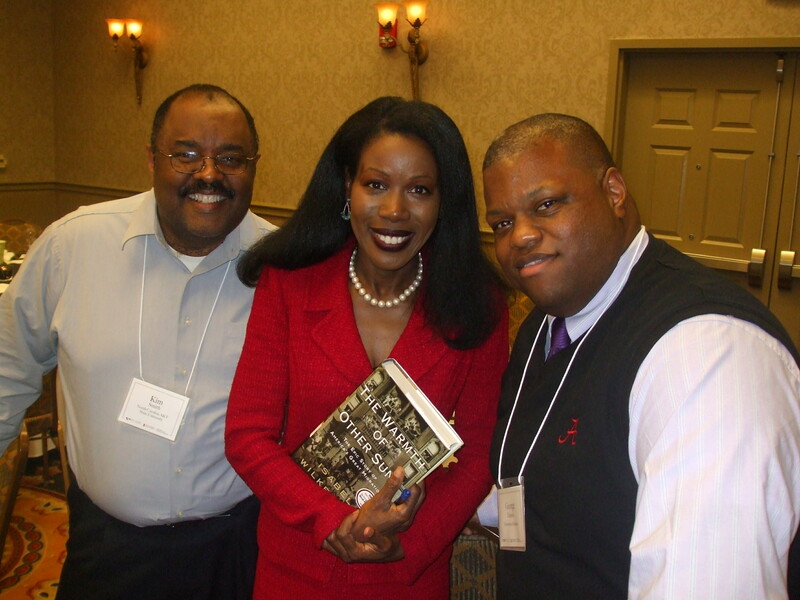 Isabel Wilkerson poses for a photo with Dr. Kim Smith (North Carolina A&T) and me after her keynote address. All three of us are Howard University alumni. The keynote address was not just about the subject of the book, but also the methods that she used to integrate journalism, ethnography and participant observation. Her address was filled with anecdotes from her experience interviewing people in senior centers, quilting clubs and AARP meetings to driving to strange communities or riding buses and being offered hoghead’s cheese. “The big challenge was food. I ate well, but I didn’t [always] know what I was eating,” she said about the cheese offer. Wilkerson rented a Buick and drove from Texas to California on the same route that one of the interviewees in her book took as he migrated away from the South in a time of Jim Crow when blacks could not stay in hotels like we can today. “This was a world that went on for three generations,” Wilkerson said. Even though the Jim Crow era began with the landmark Plessy v. Ferguson decision, Wilkerson’s book covers the time period from World War I to 1970. In introducing Wilkerson, University of South Carolina Communications Dean and Former CNN Correspondent Charles Bierbauer predicted the first African American Pulitzer Prize winner for her work in journalism may find herself in the winner’s circle for the prestigious prize again with The Warmth of Other Suns. Wilkerson is currently the director of Narrative Nonfiction in the College of Communication at Boston University. Lizard’s Thicket served up a great last-minute meal as I arrived in Columbia, South Carolina this evening. COLUMBIA, SC– On the eve of the Media and Civil Rights History Symposium, a chance to catch a “Taste of Town. Arriving here this evening after dinnertime, I had to do take-out. But, this was not just any take-out. On one of my previous visits, I was introduced to Lizard’s Thicket.